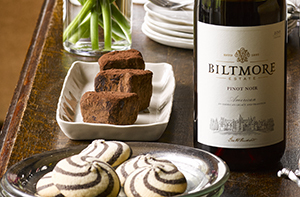 Savor Biltmore’s rich history in every sip. Founded on a love of the land – and a passion for entertaining – the Vanderbilt legacy lives on in shades of red, white, and rosé. Find the perfect wine to share with friends and family at your next gathering. Shop our wines or find a retailer near you. 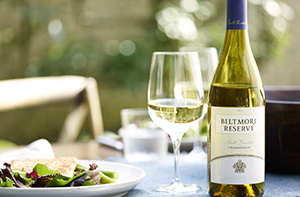 Now–April 25, save 20% on all white wines, including such award-winning guest favorites as Pinot Grigio, Chenin Blanc, and Chardonnay. Stock up and save! 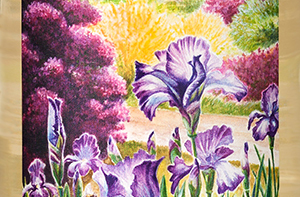 Light and aromatic with floral notes, this white wine is as lovely as the bottle’s label design, which features original art by NC artist Bryan Koontz. …and Best Buy from Beverage Testing Institute, this guest favorite is soft and elegant with wild cherry aromas, delicate raspberry flavors, and smooth tannins.